But I could tell she was not joking. She was not smiling, except in a dreamy sort of way, recalling the gentle waves and dolphins encircling her. I glanced around, as in “Did anyone else hear that?”, but in true stoic Midwestern style, no one even flinched. How I wished my daughter were there; she would have given me the OMG eye roll. As luck would have it, I was able to obtain Danielle’s email address. My curiosity just could not let this go. I asked her to tell me about her mermaid tail. Plain and simple. These first lines gave me much to ponder. The first question was easy, no, I have never wished to be a mermaid. But I can tell you my daughter and countless other girls of her generation wished to be a mermaid, The Little Mermaid, to be exact. But I don’t think that counts. Because they also wished to be Belle and Jasmine and countless other Disney princesses. The Disney princesses I was raised on did not inspire dreams. I mean, Snow White with her seven dwarfs? Sleeping Beauty, having to live in the woods with her dotty old godmothers until some guy kisses her? 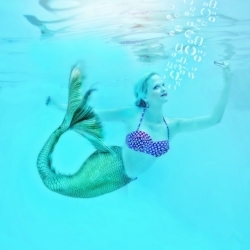 But beyond being a mermaid, I thought, was there something that I as a child always dreamed of being? Perhaps because I was not raised around the sand and sea, but instead the snow and cold and practical attitudes of Wisconsin, I did not have these lofty dreams. I dreamed of being a wife, mother, and teacher. And I did all those. But because they were such basic goals, they did not turn heads when I mentioned them at a group gathering. Danielle goes on: “This summer I swam in the Atlantic Ocean, the Gulf of Mexico, and the Pacific Ocean, as well as swimming down the Crystal River in Florida and swimming with manatees…My favorite adventure was swimming in a tank at the Sip-N-Dip Lounge, a Tiki bar in Great Falls, Montana. This of course begs the obvious question, “Why would there even be a Tiki bar in Great Falls, Montana?”, but I guess that is not the point. The point is that Danielle wanted to be a mermaid, and she made it happen. She was given a mermaid tail for her birthday in 2017 by two women who own a mermaid tail company (I am not making this up). She received her second tail this past summer, perhaps prompting that road trip to the Pacific Ocean. She sent pictures; they are stunning. She is actually a very beautiful mermaid!! I know this all sounds a little crazy, but actually it is so darn inspiring. Talk about dreaming outside the box! I’m pretty old to be trying out these childhood dreams, whatever they may be. But I am not too old to be honoring my adult dreams. (You may recall my Taylor Swift episode). Don’t worry; those dreams will not include a mermaid tail.